A 30-hour online course prepares teachers to support learner-centered 1:1 classrooms with Google Apps for Education. Teachers work individually, in "quads" (groups of four) and full cohort teams to explore and discuss readings, strategies, and key issues in light of current local practice and new opportunities presented. The course is crafted for tech-wary teachers who are not making headway on their own and need structure and supports. Course mentors (peer teacher volunteers with early aptitudes for student-centered learning and technology integration) ensure that technical barriers do not prevent these teachers from full, valuable participation in both the course and the 1:1 initiative. Apply the SCL Paradigm to lesson design and delivery. Use GAfE to streamline procedures and student communications. Move from Substitution to Augmentation to Transformation. Project Design Studio: Design and Run a 1:1 Student-Centered Project Unit. Use ADDIE to implement SCL and GAfE with Project-Based Learning. SCL 1:1 Showcase Conference: Share PBL Models for Peer Review and Adoption. 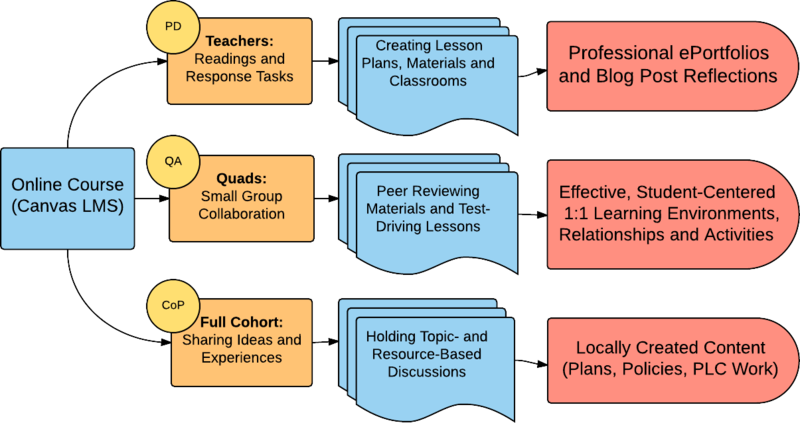 Share PBL unit designs, materials, student work, and evaluations in structured review sessions. For more information, view our Course Topics.